Sale host Tim Reich and auctioneer, Seth Weishaar at the 61st Annual Reich Charolais bull sale. 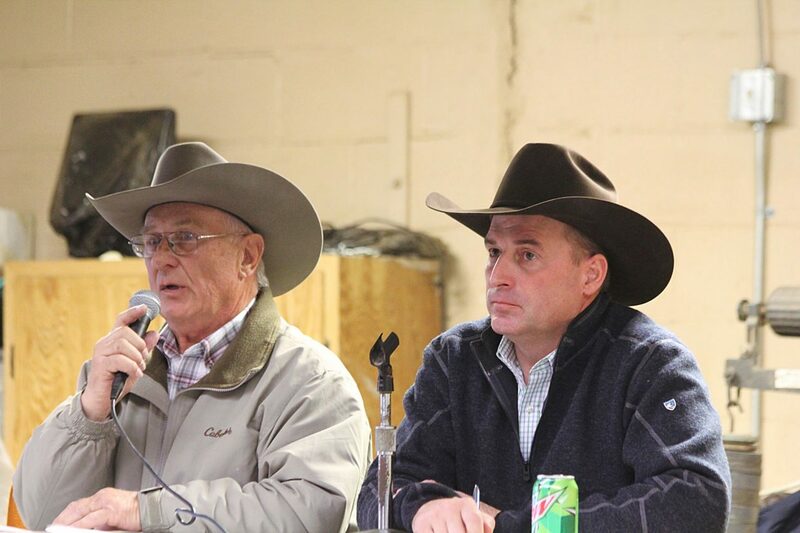 2018 marked the 61st Annual sale for Reich Charolais. There are generations of performance, calving ease and disposition bred into these bulls. The bulls in the sale had an average birthweight of 85.2 pounds, average weaning weight of 720 pounds with average yearling weight of 1,260 pounds in an area of western South Dakota and eastern Wyoming that saw very little moisture and lots of short grass. The Reich Charolais bulls will push the scale down at weaning and also provide calving ease. The top selling bull on the day was lot 6, RR Regis 720, a 2/17 son of MD Regis B3124 that has 730 pound 205 day wt., 365 day wt. of 1,380 pound yearling ratio of 111 and epds of CED 4.5 BW 1.1 WW 31 YW 56 Milk 6. Louder Farms, Draper, SD was the buyer at $4,250. Louder also got lot 3, RR Regis 714, another 2/17 son of MD Regis that has epds of CED 2.8 BW 1.2 WW 47 YW 74 Milk 0. This bull had a yearling ratio of 129 and sold for $4,250. Lot 43, RR Cadet 7122, a 3/17 son of BHD Sir Half Fours A518 that has epds of CED -.1 BW 1.9 WW 35 YW 63 Milk -10 sold to Lyle Newman, Hysham, Montana, for $4,250. The threat of a major spring storm with high winds and several inches of snow predicted for overnight and days following the sale held the crowd back a bit so there were some bulls left over. If you are needing a Charolais bull go ahead and contact Tim Reich, he will be more than willing to help you out.